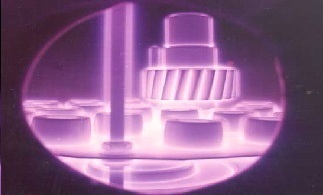 Plasma Nitriding is a surface hardening process, in which nitrogen is diffused in to the components surface. Plasma nitriding produces high surface hardness, good wear resistance, increased fatigue strength and toughness. Reduced (by 20-50%) treatment cycle compared to gas nitriding process. Better process control and automation. Higher surface hardness can be achieved (up to 1200 HV, 70 HRC). Better dimensional stability (lower distortions) due to lower process temperature and uniform heating. Cases with uniform depth are formed even over parts with complex shapes. Easier masking for selective nitriding.